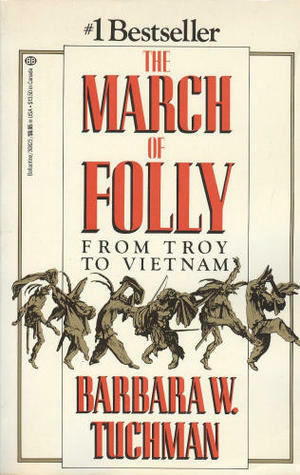 Six years ago, in July 2012, I read and reviewed Barbara Tuchman's book, The March of Folly: From Troy to Vietnam. It hit me right in the solar plexus. Rereading my review today, a couple of days after our most recent election, I was once again struck by Tuchman's clear-eyed view of history and of human nature. Her observations are just as fresh today as they were when this book was published in 1984 or when I read it in 2012. I venture to predict that they will remain fresh as long as humans continue to exist. A couple of sentences of my own review seem particularly cogent and applicable today, also: "When we see or hear evidence that contradicts our ingrained beliefs and what we want to believe because it makes us feel good, we just ignore it. That is the essence of human folly." George Santayana wrote, "Those who cannot learn from history are doomed to repeat it." The extraordinarily pessimistic theme of Barbara Tuchman's book, The March of Folly: From Troy to Vietnam, seems to be that we are all incapable of learning from history and so we are doomed to repeat its errors over and over and over again, ad infinitum. All of human history has been a march of folly with occasional flashes of insight and brilliance which allow us to advance a bit. Tuchman finds plenty of examples to support her thesis. Her definition of folly within the context of the book is the pursuit by governments of policies contrary to their own interests, despite the availability of feasible alternatives. She begins with a general discussion of several examples from history and literature such as Rehoboam, a king of ancient Israel whose obstinance in refusing to listen to the just complaints of his people resulted in the loss of the ten northern tribes of Israel, and Montezuma whose vacillation and failure to heed the warnings of his advisers caused the loss and ultimate demise of the Aztec kingdom. She then proceeds to longer and more detailed discussions of four specific examples of incredible folly. The first is the prototype for all follies that come after: The Trojans accepting the "gift" of the wooden horse from the Greeks. The horse was brought inside the gates of the city in spite of ample warnings from multiple sources not to trust "Greeks bearing gifts." Priam did not heed the warnings and his city fell. The second example is that of the Renaissance popes whose decadence and emotional and intellectual distance from the common people led to a revolt by those people against the Church and, ultimately, to the Reformation. In the third example, the British lose America. It is incredible to read of the series of political blunders, miscalculations, and miscommunications that led inexorably to the decision of the colonies to separate themselves from their Mother Country. It need not have happened. The colonists had time and again signaled their willingness to contribute to the Treasury; they simply wanted to be consulted about the manner in which it would be done and they wanted representatives in London to defend their interests. King George and his advisers would not accept their request and paid a heavy price for their refusal. Finally, we come to the folly of the American experience in Vietnam. It began in 1945. Vietnam had been a colony of France and, after the humiliation of World War II, the French were determined to hang on to it in spite of common sense dictating otherwise. Ho Chi Minh had been trying since just after the first World War to gain independence for his country. He had attempted to present a petition to that effect to the "great powers" after that war, but they refused to accept it. A pragmatic patriot, he later joined the Communist Party when he saw that as a means for achieving independence. Through all the years of his and his followers' struggle, the French and later the Americans seemed to fail to understand the depth of their commitment to being free of foreign overlords. The Americans had forgotten their own 18th century experience with the British. The American experience in Vietnam began in the Truman Administration with the deployment of 35 "advisers." For the next twenty years, those numbers would gradually grow until they exploded during the Johnson presidency. Reading of the decisions of Lyndon Johnson just makes one shake one's head even today. How could such brilliant men be so stupid? How could they utterly fail to heed all the warnings and assessments of those who knew the country, the region, the history, and the people? Well, how could the Trojans have accepted that Greek horse? When we see or hear evidence that contradicts our ingrained beliefs and what we want to believe because it makes us feel good, we just ignore it. That is the essence of human folly. Reading this book made me wonder what Barbara Tuchman would have had to say about the last decade of American history. What would she have written about this country's reaction to the events of September 11, 2011; the wars, the abrogation of the individual's constitutional rights, the imprisonment without trial, and, yes, the torture? There are those who like to spout about American "exceptionalism" as if we somehow stood outside of history. We don't. Our follies prove it. History, as most things, look different (even obvious) in hindsight. It is certainly easier to see the patterns in hindsight. I will add this book to my nonfiction works on Vietnam. That conflict made a huge impression on my life and will feature in my autobiography. I have always heard good thing about Tuchman but have not yet read her. Thanks. She was a remarkable historian and story-teller. I also recommend her book A Distant Mirror which I read earlier in 2012 - https://birdwoman-thenatureofthings.blogspot.com/search?q=a+distant+mirror. Wednesday in the garden: Gifts of the Monarch. Throwback Thursday: What is it with these guys?